Asset pricing is the history of attempts to understand how security prices (or values of claims to uncertain cashflows) evolve over time and to identify determinants of asset returns that can be fruitfully extrapolated to the future . Linear pricing models attempt to decompose the return on an asset into a set of common risk factors and an idiosyncratic component, the former being shared across assets within an asset class (sometimes even across asset class definitions) and the latter being specific to the asset under inspection. Such factor models are typically employed to predict returns (both in and out of sample with varying degrees of success), to identify risk sensitivities and to estimate abnormal returns. If, as an outcome of a statistically significant factor model, an asset’s actual return exceeds (falls short of) its theoretically correct return, then that asset’s current price falls short (is in excess of) the theoretically justified price and can be classified as being undervalued (overvalued). Assuming that the model employed to assess this mis-pricing is correct and that markets are efficient enough to eventually correct this difference between the asset’s current market quoted price and its theoretically correct equilibrium price, undervalued securities will be bought while overvalued securities will be shorted. While traditional expositions of asset pricing tend to trace the history of theory development (portfolio theory-efficient frontier-CAPM-ICAPM-APT-Option pricing models-Consumption CAPM), Cochrane (2005) obtains a more useful framework by starting from the end rather than the beginning. In other words, the microeconomic principles that underlie the Consumption CAPM can be generalised to encompass all asset pricing models that enjoy historical precedence. The objective is to determine the value of any stream of uncertain cash flows associated with an investment. It turns out that the basic pricing equation can be derived from a typical choice problem that a representative economic agent faces. The following exposition is brief and necessarily incomplete,drawing on Cochrane (2005) to provide the overarching framework for asset pricing that is most relevant to our experiments. ξ represents the amount of the asset he chooses to buy at time t.
in words : Find the optimal amount of assets to buy (ξ) at time t which maximises the agent’s expected utility from current consumption (c(t)) and future consumption (c(t+1)), subject to constraints. Basically, how much of an asset(ξ) must the representative agent purchase today at price p(t) in order to maximise his utility from current and future consumption. m is the stochastic discount factor (also known as the pricing kernel or the marginal rate of substitution). It represents the investors’ willingness for inter temporal substitution or the rate at which the agent is willing to trade off current consumption levels for future consumption levels. The universe of asset pricing models can be regarded as special cases of the central pricing equation, typically by finding a suitable expression for the pricing kernel. 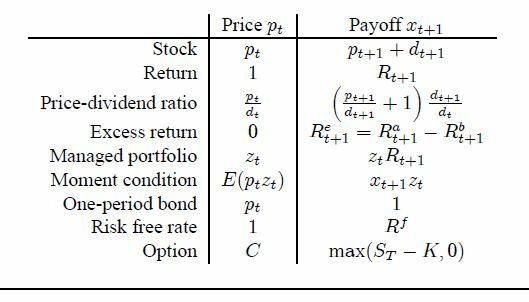 Factor pricing models for instance specify the stochastic discount factor as a linear function of the form m=a+b’f where the vector of factors (f) is chosen for a proxy of the investors marginal utility growth. If the payoff (x) is positively correlated with consumption (c), risk increases and the asset price (p) must increase. if the payoff (x) is negatively correlated with consumption (c), risk decreases and the asset price (p) must decrease. These observations imply that an asset’s return must increase to compensate for a higher covariance between payoff and the stochastic discount factor. So far the framework is generalised to any asset that has a price and a payoff. This notation is very general and allows different asset pricing issues to be accommodated. In many ways, the price and payoff variables above are simply placeholders for other asset specific variables. As per Cochrane (2005), there is only one theory for all asset pricing whether it be stocks,bonds or options. The following table by the same author summarises the notational differences across assets. The return on a stock can be thought of as a payoff with a price of one. The key issue pertains to the selection of factors f. More precisely, factor pricing models seek variables that are good proxies for aggregate marginal utility growth , in effect variables for which the following relation holds. The Sharpe ratio, which is basically the equity premium divided by total risk, is governed by the volatility of the pricing kernel (m). From these two relations, the third equation for expected asset returns can be derived. Here we shall try to explain the role of utility functions in portfolio management and the CAPM, a theory of equilibrium that drops out of basic portfolio management ideas. Here we shall examine the two-pass regression technique applied by Lintner to test the CAPM, look at how different estimation windows imply parameter instability and some relevant consequences and problems with the technique. Here we shall look at the first improvements of estimation methodology made to account for the problems of Lintner’s simple regression. Both the BJS and FM procedures rely on grouping stocks into portfolios sorted by individual stock betas. Here we shall examine the size effect due to Banz (1981), the notion that small capitalisation stocks have a tendency to outperform larger companies over the longrun. This relation has deteriorated over the years and no conclusive relation between size and stock performance can be made. We shall also examine the value effect due to Graham and Dodd (late 1930s), the observation that value stocks have a tendency to outperform growth stocks. Failure of the CAPM to explain value and size effects across stocks implies that value firms and small firms are exposed to systematic sources of risk not accounted for by the typical proxies of the market portfolio, a deficiency of the CAPM that motivated the Fama-French 3 factor model. Macroeconomic factor surprises comprise the independent variables in such models. Chen,Roll and Ross (1986) for instance used variables such as : changes in expected inflation, default spread, term spreads and several other factors. Here we shall examine the time series predictability of returns using a simple VAR framework which can be used to explore impulse response functions. Here we shall apply more sophisticated models on asset pricing relations,typically to account for the variability of estimated parameters in such models. Since Betas are not really constant, suitable time series models must be adapted to account for this empirical fact. The Conditional Beta can be modelled directly via State space models/Kalman filter, or indirectly via GARCH and stochastic volatility models.